Anton is a 27 year old dollar millionaire – at least in net wealth terms. While he seems to have made about two thirds of that wealth through the US equivalent of leveraged Buy to Let property investment it’s still a pretty impressive feat. 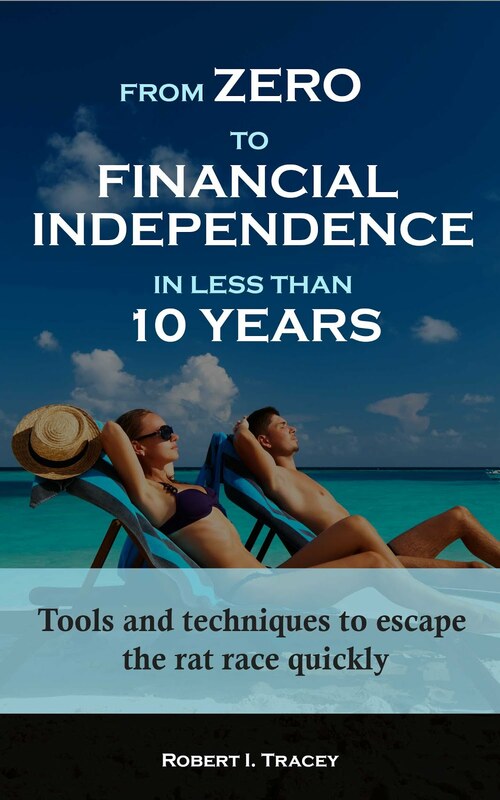 Building that type of wealth in such a short time is not a lot different to what I’m trying to achieve, that is financial independence giving the option of early retirement in less than 10 years. His 10 Habits That Made me a Millionaire post this week therefore intrigued me. Let’s look at these 10 habits in turn and compare notes. I have a proverbial shopping list of financial goals that I've set and then track myself against. They cover everything from weekly targets for fuel economy on my monster commute and grocery shopping spend targets through to longer term goals including the amount of wealth I require for financial independence including timescales to get there. I even go one step further and publically score myself against some of these goals at regular intervals. If you’re chasing financial independence then the buck stops at Net Worth. I have recorded the values of every one of my investments which I then sum to give net worth every week since 2007. I've never missed a week. 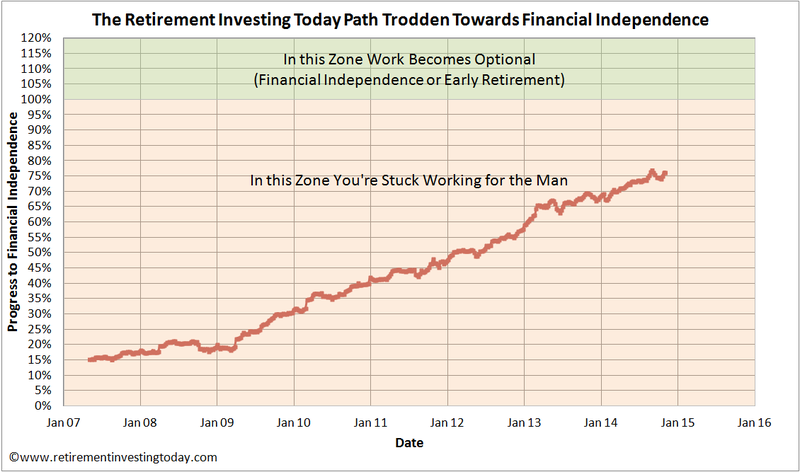 From that history I can then build charts like that below which track my progress to Financial Independence. It also enables me to easily measure progress against my goals. He doesn't say whether this is Gross or Net Income but for a long time I was saving 60% of the more difficult Gross. I've had to recently relax that to 55% only because a recent healthy pay rise has pushed me well into Higher Rate Tax where including National Insurance I'm losing 42% which makes it impossible to save 60% of Gross. With that in mind I'm declaring a pass against this habit. You don’t get to 55% or 60% savings rates over many years and also buy expensive things. Over the years I've found that health, wellbeing and genuine family enjoyment don’t require vast spending let alone vast expensive spending. I've also developed a simple method to ensure I part with the least amount of cash to secure what I do buy. Pay Yourself First was one of the first posts I ever ran on this site. It’s something I am fanatical about. To give an example, today is the first of November and I'm paid on the last day of the month. Already (read during a Friday 15 minute work break following preparation earlier in the week) my savings have been transferred out of my Current Account into both my own investment/savings accounts and those of my better half. This month’s cash injection also enabled my next High Yield Portfolio (HYP) purchase – Tate & Lyle (Ticker: TATE) with its 4.6% trailing dividend yield. I'm still amazed that people take on consumer debt. Having seen both in person and theoretically the damage debt can do to both your wealth and wellbeing I'm also having none of it. In the interest of full disclosure I must say I do have a few hundred pounds on a credit card as I write this however the cash is readily available to cover the debt, it will be paid by automatic direct debit before any interest is due and it’s only there in the first place to help me save a bit harder. I have 6 months of expenditures in a readily accessible savings account which could be in my current account in less than 3 days. Check. This is actually getting to the point of being quite extreme with the likely scenario being that I will actually pay cash for our eventual family home. My strategy is mechanical and requires no emotion. Every single month for the last 7 years I've saved and invested according to that strategy. I was buying all through the back end of 2007 and 2008 when the sky was falling. I have a lot more wealth now so will I hold my nerve through the next ‘financial crisis’? Of course only time will tell but I’d bet on yes given my mechanical investment strategy and past form. So that’s 10/10 for me. The million dollar question is then do I currently have enough wealth to make me a dollar millionaire should I wish to be one. In short, Yes! How did you score and are you a dollar millionaire? It would be great to see if these habits really do correlate to being a member of the million dollar club. > While he seems to have made about two thirds of that wealth through the US equivalent of leveraged Buy to Let property investment it’s still a pretty impressive feat. Stopping reading here. If everyone did this we'd have nothing as it's not wealth generation just exploitation. I don't think anyone with average (or median) salary can expect to become a millionaire by 27 yo. One can, but taking very high risk and access to a financing/leverage, thus, with very high risk of failure/bankruptcy. One out of 1000 of such adventurers will be successful and then writing a book about it. From other 999 no one will hear at all. "Higher Rate Tax where including National Insurance I'm losing 42% which makes it impossible to save 60% of Gross." If you popped the whole of your income exposed to HRT into pensions, using carried forward allowance if needs be, and then bought some EISs to cut your basic rate tax, couldn't you manage it? Or would you consider yourself then over-pensioned? RIT has expressed reservation at putting much more the way of pensions because of a fear of possible future changes to pension rules (and taxation I guess). Regarding EISs, is this not pretty high risk? Where would one start wanting to invest wisely in EISs? I recently gave a couple of days study to EISs, and then decided "not on your life". A rich man's plaything, perhaps, but not for us, certainly. I was wondering about pension-filling now partly because of a different political risk - the risk that 40% taxrelief might not be available much longer. Lots of people are dollar millionaires; just capitalise the value of their DB pensions and State Retirement Pensions. In future the category will be populated particularly by retired government employees who will, however, reserve their right to whinge about "the rich". well im happy to say im doing all of these 10 points and always have my first earnings were £20 my dad said to me, save £15 spend £5 good advice gets you into the habit of living of less from the getgo!. ive saved rather than invested though which was my only mistake but ive started investing carefully now. > If you’re chasing financial independence then the buck stops at Net Worth. I struggle with this a bit, there are a lot of issues with networth. Brits in general should be careful and probably exclude property if owned, because the relative high cost of housing consumes a very high amount of people's NW, usually more than 50%. Particularly if it's the equivalent of a McMansion or is within 100 miles of London. I appreciate this particular part of the hazard doesn't apply to you, but in general for Brits I'd say don't count property. I don't represent the value of my house anywhere in my financial considerations, because this noise and hum makes it hard to see what's going on. A lot of people in the PF community fixate on networth, but I suggest it's less useful for many of them than it appears. However, I am pretty sure you have the details to do a 10-year integration/extrapolation of NW, in which case the result may be more informative. The income thrown off by equities varies much less than the market value. 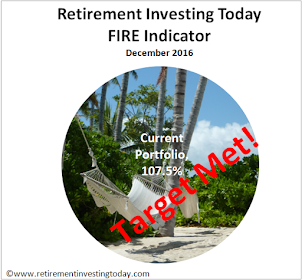 Which is nice, and good for retirees because that is what they need. I max out my employee/employer pension contributions to gain the maximum co-pay, and that's built a very nice little pot over the years, but the bulk of wealth has come from one simple rule. Buy a house as early in life as possible and never sell when you move. Through never buying houses for landlords and having other people continue to buy houses for me after I'd lived in them for some years, dollar millionaire status was achieved painlessly years ago. @Anonymous14 November 2014 01:50: "Buy a house as early in life as possible and never sell when you move." Putting all your stored wealth into just one asset class is a fragile investment strategy. Real estate is not a flexible way to store wealth for an individual, because trading it is expensive, and the cost of an indivudal asset (a house) is large. You're conflating your domestic-residence strategy with your investment strategy. The residences you want or need to live in will only randomly coincide with what's a good investment. You've done well with the technique you describe, because you were lucky, and exhibit survivorship bias. The gearing inherent in using mortgage finance to acquire real estate tends to mean that investors tend to do very well, or very badly. Your risk-adjusted return is far lower than the crude growth in wealth that you've actually experienced. "But I cannot fathom the concept of voluntarily choosing to buy houses for landlords as part of any rational wealth building strategy..... Or of failing to take a relatively safe leveraged capital building strategy when the opportunity presents...."
Some real-estate investors have done well in the past. Geared real-estate investors have done especially well duing periods of high inflation, because their debts evaporate while their income rises (Tim Harford, "The Undercover Economist", wrote a good article on this in the FT a week or so ago). Some real-estate investors have been crushed by the performance of their assets, for example in Detroit, USA. Real estate in the Netherlands is down by 20% from the peak.